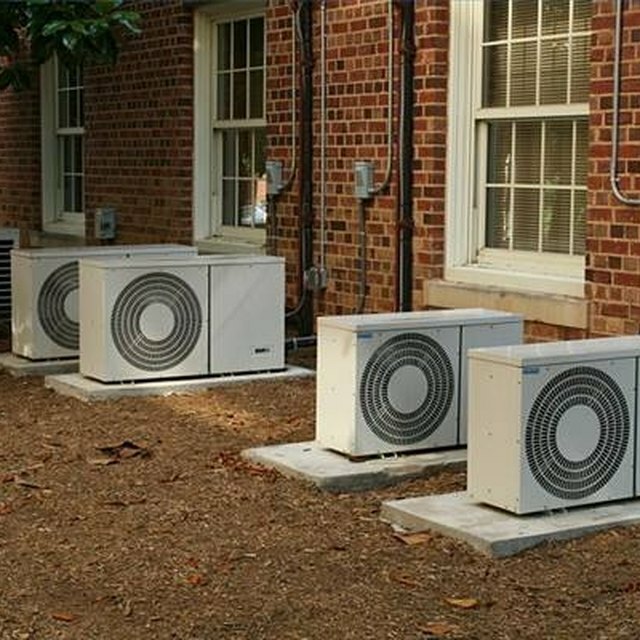 The compressor and condenser of a ductless, split-system air-conditioner (AC) is usually located outdoors and most often on the ground. A split AC funnels the chilled air through flexible tubing to the room to cool. The controls for setting temperature and airflow are on a panel located in the room that is cooled. While split air conditioners are more powerful, less noisy and have other advantages over an AC set in a window, they have several disadvantages as well. A split AC is not as good as a window AC for the upper floors of an apartment building. A split AC might cost more than twice as much as a window AC. About 70 percent of new installations are window ACs and 30 percent are spit ACs. The cost factor is even more important if only a small area needs requires cooling; in that case, a window AC may be a better choice. Installing a split AC is complicated and takes far more labor. The overall costs to install one are far greater than a window AC. The farther a split AC compressor is from the space to cool, the more involved is the tubing needed to carry the cooled air, which increases the cost of installing a split AC. Generally speaking, a split AC is impractical or even impossible for an apartment located far from the ground where outdoor compressors are usually located. A split AC can generally push air 30 to 40 feet to the area to be cooled. If you live in a 10th floor apartment, it is unlikely that you can install a split AC. If you rent an apartment or house and you move frequently, installing a split AC is not good. Not only is it more far more costly to install a split AC, but it is also more expensive to uninstall one. If you move a lot, a window AC is a better choice.